At nightfall tonight, the starlit Eyes of Draco the Dragon peer down upon you from almost overhead. Their names are Eltanin and Rastaban. If the sun, Eltanin and Rastaban all were located the same distance from us, it’s thought that Eltanin would shine 600 times more brightly than our sun and that Rastaban would shine 950 times more brightly. Though Rastaban is actually the more luminous of these two stars, Eltanin appears slightly brighter to our earthly eyes. That is because it is much closer. Eltanin is 148 light-years away, in contrast to 362 light-years for Rastaban. How can you find Draco? 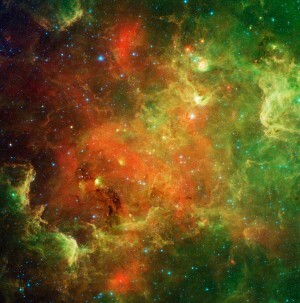 You will need a dark sky because these stars are faint. The stars of Draco wind around the famous North Star, or Polaris. Go back to our July 1 sky chart to locate Polaris in relationship to the Big Dipper. According to a famous tale, Draco represents Ladon, the ever-vigilant Dragon who was hired by the goddess Hera – Zeus’ wife – to guard the Golden Apples of Immortality at the Garden of the Hesperides. By some accounts, Ladon is immortal, but other stories say the Dragon was slain by Hercules on his Eleventh Labor. 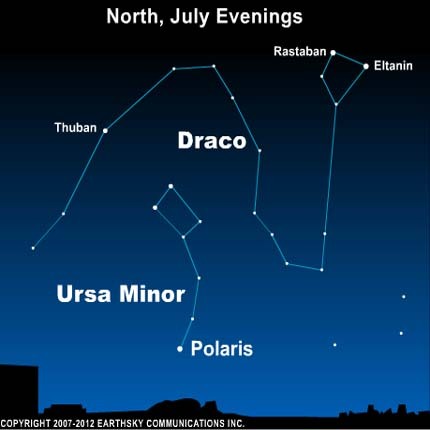 Draco reaches its loftiest position above the North Star Polaris on July evenings. Draco’s stars are faint, and you will need a dark country sky to picture this winding trail of stars.